Zooming changes the magnification of the data shown onscreen in Word 2013. Zooming doesn’t change the magnification of the application window itself (for example, the Ribbon), and it doesn’t change the size of the data on printouts. Zooming in increases the magnification, and zooming out decreases it. Open a Word 2013 document; drag the Zoom slider all the way to the right. The Zoom slider is located in the bottom-right corner of the Word window. The zoom level increases to 500 percent. Drag the Zoom slider to the left, so that the zoom setting is 50%. When the zoom magnification decreases to 50%, the document’s two pages appear side by side. Click the plus sign at the right end of the Zoom slider. Click the minus sign at the left end of the Zoom slider. Click the current zoom percentage (the number to the right of the Zoom slider). The Zoom dialog box opens. You can also open the Zoom dialog box by clicking the View tab on the Ribbon and clicking the Zoom button. 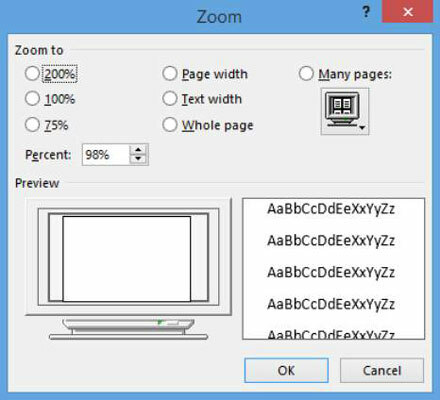 In the Zoom dialog box, select 100% and then click OK. The zoom changes back to 100 percent (the default). Close the document. Do not save changes if prompted.